all of which I hope will bring a smile to your heart. If you've been enjoying the Snippet Rolls and need simple instructions, I've just released a tutorial digest on Magcloud. See right sidebar for link. Sweet Crickette. Thank you, Beth! From Beth N. - Thanks, Beth! From Linda F. - Thanks, Linda! Thank you for not copying my artwork, text or photos without my permission. All images, artwork, designs and text are protected by copyright. If you would like more information, you may email me here. Thanks for linking to my blog! Earlier this week, I was able to snap a picture of one of my mother’s latest creations. Isn’t it beautiful? 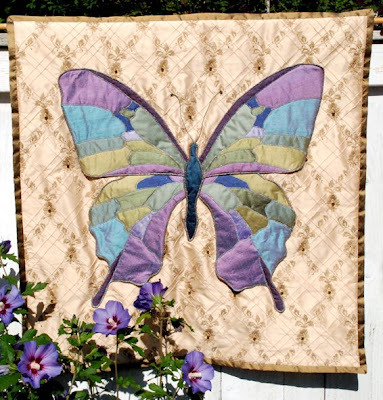 She used all silks in this piece and constructed the butterfly separately so it dramatically stands away from the background. I can hardly wait until it flies back home after the upcoming quilt show! I didn't get to see this in person... WOW! I envy those with such talent!!! This is BeAUtIFuL! The colors in the butterfly are so brilliant they look like a stained glass window. This is stunning!